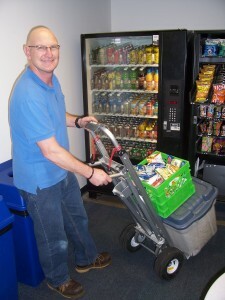 We provide vending machines and stock them at no cost to you. We work with you in providing the right machines and selection as each location is different. We simply do what makes sense for both of us. We are small enough to keep it personal and big enough to cope. Most of our business is word of mouth and we work hard to keep it that way. When chosing a vending company, there are many choices out there. All very different. We would love to tell you we are the best but that would have no value. We advise that you call customers for refferals.That has value, and would help you choose what is right for you, the first time. We offer a wide variety of snacks and beverages which is ever changing due to the exciting selection that is available for offer. Healthier choices are available as this is a growing trend in the business. Environmental and social responsibility appears to be common to most vending operators today as it is such a large part of our culture. 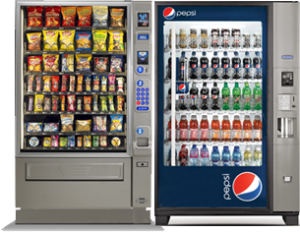 Kelowna vending is a local owner-operated company, providing snack and beverage machines to many locations in the Okanagan. We have awesome customers who treat us like friends when we call to restock the machines. Service is very personnalised. As owners we chose to restock our machines ourselves. This allows us to constantly make improvements and keep in touch with what our customers really want. We do this just as much for ourselves as our customers, becuase it obviously leads to increased business. COPYRIGHT 2013 KELOWNA VENDING. ALL RIGHTS RESERVED.